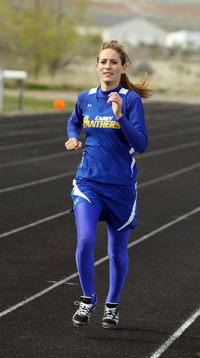 Team balance in all of track and field’s disciplines turned into a team title for the Carey High School girls Thursday during the 13-school Monte Andrus Invitational at Jerome. The Carey girls (25 points sprints, 38 distances, 12 hurdles, 24 relays, 38.5 field) put together many highlights in amassing their 137.5-point total. Wells finished with 113.5 points and third-place Raft River of Malta settled for 100. Senior Jaide Parke led Carey to its 38-point haul in the distances with victories in the 800-meter run, 1600m and 3200m. Parke (2:43.60) and second-place Lilly Rivera, a Carey junior timed in 2:47.00, placed 1-2 in the 800m event. Parke ran away with the 1600m by over nine seconds in 5:57.00 and the 3200m by nearly 36 seconds in 12:33.90. Carey’s girls also had three other gold medals. Freshman Kelsey Barker won the 100m dash with a time of 13.70 seconds. Winning the 4x200m relay by nearly three seconds in 1:55.70 was the Panther squad of Rivera, Barker, Medin Cenarrusa and McKayla Mecham. Junior Daphne Kirkland captured the pole vault with a seven-foot jump. Carey hasn’t had a pole vaulter since 1977, coach Kirkland said, and has never had a female pole vaulter. The coach promoted his junior-class daughter Daphne to take that task, and she earned 10 points for the Panther cause. The Carey boys (37 points) finished ninth of 13 schools behind the Hagerman Pirates (150.5 points, 66.5 in the sprints and distances, 44 in the field). Top Panther finish was the third-place 4x100m relay with Christian Zarate, Luis Garcia, Jordan Dilworth and Tori Alvarez. Senior Francisco Gamino was fourth in shotput (43-6) and junior Garcia fourth in the long jump (18-9). Carey hosts the Carey Invitational Thursday, April 18 at Derrick Parke Memorial Field. Kirkland expects a competitive field including Rockland, Mackay, Camas County and Hagerman. Medals will be given in the first of two meets on the Carey track this spring. Teams: 1—Carey 137.5 points (25 sprints, 38 distances, 12 hurdles, 24 relays, 38.5 field). 2—Wells (Nev.) 113.5 points (27.5 sprints, 13 distances, 23 hurdles, 7 relays, 43 field). 3—Raft River of Malta 100. 4—Hagerman 91.5. 5—Valley of Hazelton 51.5. 6—Shoshone 37. 7—Wendell 35. 8—Castleford 29. 9—Lighthouse Christian Academy 26. 10—Murtaugh 20. 11—Jackpot (Nev.) 17. 12—Dietrich 13. 13—Glenns Ferry 6. 100m: 1—Kelsey Barker (C) 13.70. 5—Clarissa Kirkland (C) 14.30. 200m: 3—McKayla Mecham (C) 29.10. 4—Kelsey Barker (C) 29.10. 800m: 1—Jaide Parke (C) 2:43.60. 2—Lilly Rivera (C) 2:47.00. 1600m: 1—Jaide Parke (C) 5:57.00. 3200m: 1—Jaide Parke (C) 12:33.90. 100m high hurdles: 8—Emily Wittemann (C) 22.30. 300m intermediate hurdles: 3—Medin Cenarrusa (C) 55.60. 4—Hailee Johnson (C) 56.20. 4x200m relay: 1—Carey (Lilly Rivera, Kelsey Barker, Medin Cenarrusa, McKayla Mecham) 1:55.70. 4x400m relay: 2—Carey (Hailee Johnson, Lilly Rivera, McKayla Mecham, Medin Cenarrusa) 4:45.20. Sprint medley relay: 3—Carey (Arriana Nielson, Clarissa Kirkland, Hailee Johnson, Lilly Rivera) 2:10.20. Shotput: 7—Natalie Villanueva(C) 27-10.75. Discus: 6—Natalie Villanueva(C) 79-0. Pole vault: 1—Daphne Kirkland (C) 7-0. High jump: 4—Shayla Adamson(C) 4-2. Long jump: 2—Hailee Johnson (C) 13-10.5. 3—Medin Cenarrusa (C) 13-10. 8—Clarissa Kirkland (C) 13-1.5. Triple jump: 5—Clarissa Kirkland (C) 28-2.5. Teams: 1—Hagerman 150.5 points (30.5 sprints, 40 distances, 0 hurdles, 36 relays, 44 field). 2—Raft River 104. 3—Castleford 85. 4—Wendell 71. 5—Murtaugh 49. 6—Lighthouse Christian 46. 7—Valley 40.5. 8—Dietrich 39. 9—Carey 37 (0 sprints, 0 distances, 0 hurdles, 17 relays, 20 field). 10—Shoshone 10. 11—Jackpot 9. 12—Hansen 8. 13—Wells 5. 4x100m relay: 3—Carey (Christian Zarate, Luis Garcia, Jordan Dilworth, Tori Alvarez) 47.90. 4x200m relay: 4—Carey (Christian Zarate, Gunner Thompson, Jordan Dilworth, Luis Garcia) 1:42.60. 4x400m relay: 6—Carey (Jordan Dilworth, Zach Olsen, Tori Alvarez, Gunner Thompson) 4:24.50. Sprint medley relay: 6—Carey (Nate Adamson, Jordan Dilworth, Colin Whitby, Zach Olsen) 4:17.50. Shotput: 4—Francisco Gamino (C) 43-6. High jump: 5—Bryson Van Every (C) 5-2. Long jump: 4—Luis Garcia (C) 18-9. 6—Bryson Van Every (C) 18-1.5. Triple jump: 6—Bryson Van Every (C) 35-6.25.